Children 6 and under are free each day. Thursday "Fun Day, Fair Day" : FREE until 12:00 pm. and after 12:00 p.m. tickets $5. No dogs or pets allowed on the fairgrounds. No electric scooters rentals available. 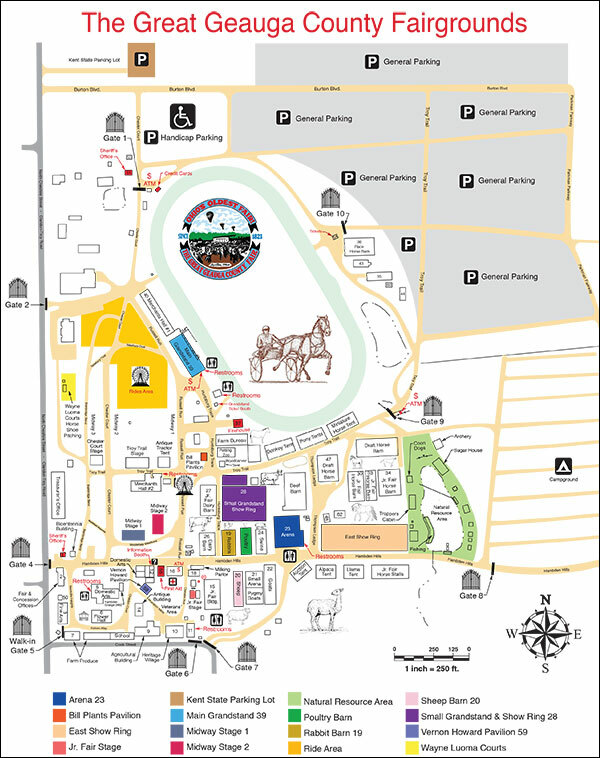 Hand stamps for re-admission to fair are only available at time of entrance. Huge Savings with Advance Sale Tickets! The best deal in town! Advance Sale Tickets are your chance to see all the fair has to offer at a discount. The one-day tickets are individual tickets $2 off the regular $8 admission. The five-gate admission tickets are a punch card that can be used by anyone. This punch card can be used for five entries on the same day or one person to come all five days. Use as you like for five gate admissions. This offer is only available up until the Wednesday before the fair. Exhibit Halls and Buildings: 10:00 a.m. - 10:00 p.m.
​Secretary's Office: 9:00 a.m. - 9:00 p.m.
​Monday, September 3 - Labor Day exhibits close at 8:00 p.m.
Wednesdays: 9:00 a.m. - 3:00 p.m. Weekdays from August 1 - August 24: 9:00 a.m. - 3:00 p.m.
Saturday, August 4: 9:00 a.m. - 3:00 p.m.
Saturday, August 25: 9:00 a.m. - 2:00 p.m.
Sunday, August 26: 9:00 a.m. - 2:00 p.m.
Monday, August 27: 9:00 a.m. - 4:00 p.m.
Tuesday, August 28: 9:00 a.m. - 9:00 p.m.
Wednesday, August 29: 9:00 a.m. - 9:00 p.m. The Geauga County Agricultural Society has a Board of twenty-one (21) elected Directors. These Directors, one elected from each township and five elected at large, hold office for a term of three (3) years with the terms so arranged that one third of the terms shall expire annually. Directors meet the third Thursday of every month, 8 p.m. in the School Building on the fairgrounds. Meetings are open to the public. Society. Membership tickets are $30.00 each, including (5) admissions to the fair, and the right to run and vote for Director of the Society. Tickets available at the Secretary’s Office until end of fair at 4:00 p.m.